Samsung and Visa team up to bring payWave to Galaxy phones | Android Blast! Samsung and Visa have announced a partnership to bring payWave to Samsung phones. All Samsung smartphones with NFC chips will come pre-installed with Visa payWave, allowing users to pay for products with their phones. This probably means the next Galaxy phone, the S4, will get payWave. Financial institutions will be offered a secure service to download payment account information to Samsung�s mobile devices. FOSTER CITY, Calif.�(BUSINESS WIRE)�Feb. 25, 2013� Visa and Samsung today announced a global alliance that combines Visa�s expertise in payments with Samsung�s leadership in mobile device technology � an alliance that has the potential to significantly accelerate the availability of mobile payments globally. According to the agreement, financial institutions that are planning to launch mobile payment programs will be able to use the Visa Mobile Provisioning Service1 to securely download payment account information to NFC-enabled Samsung devices. 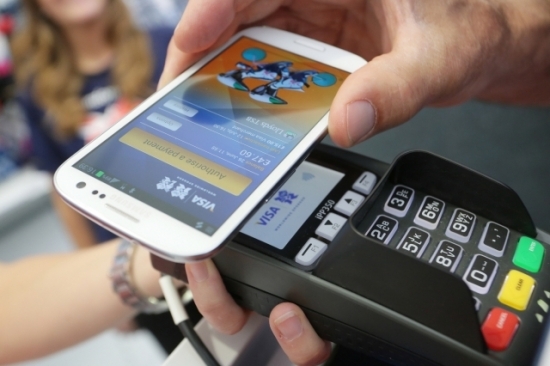 In addition, Samsung has agreed to load the Visa payWave applet onto its mobile devices featuring NFC technology. Visa payWave is Visa�s mobile payment applet that enables consumers to make �wave and pay� contactless payments using mobile devices. In order to enable financial institutions to launch large scale mobile (NFC) payment programs, Samsung will offer banks the ability to load payment account information over-the-air to a secure chip embedded in Samsung devices, using Visa�s Mobile Provisioning Service3 which is linked to Samsung KMS (Key Management System) � a service that creates secure data storage domains for issuers. The Visa payWave mobile applet will be preloaded onto selected next-generation Samsung mobile devices featuring NFC technology and an embedded secure element. Off the shelf, these devices are ready to be personalized with Visa payment account information � a simple step that consumers will be able to initiate using a mobile payment application provided by their financial institution. Visa is a global payments technology company that connects consumers, businesses, financial institutions and governments in more than 200 countries and territories to fast, secure and reliable electronic payments. We operate one of the world�s most advanced processing networks�VisaNet�that is capable of handling more than 24,000 transaction messages a second, with fraud protection for consumers and assured payment for merchants. Visa is not a bank and does not issue cards, extend credit or set rates and fees for consumers. Visa�s innovations, however, enable its financial institution customers to offer consumers more choices: pay now with debit, ahead of time with prepaid or later with credit products. For more information, visit corporate.visa.com.